NOTE: Expansion Module Required for Connectors Larger than 60 Pins! Use CB12 to test high-density flat cables with IDC wiremount sockets (0.025" wire centers, 0.050x0.100" pin centers). Three 80-pin positions are available on each board. Because of the many varieties of high-density connectors available, the board is provided without connectors. 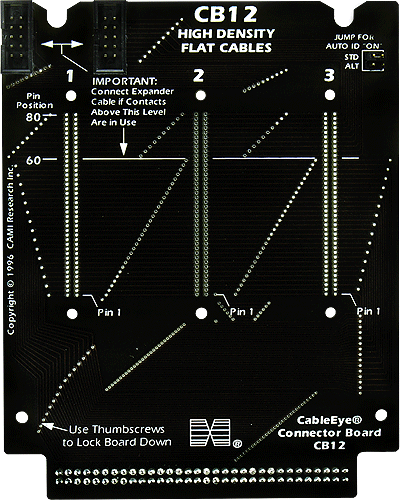 Users should populate this board to meet their requirements using connectors they provide. Standard header sizes are: 80, 68, 60, 50, 40, 34, 30, 26, and 20 pins. For 3M-style connectors (side-release latches), the board will accommodate any THREE sizes. For Thomas&Betts connectors (front-release latches), any two of the smaller sizes (40, 34, 30, 26, and 20) may share a single position. For a small assembly fee, CAMI Research will gladly solder into place and test connectors that the customer provides; contact us for details. Set of two boards with expander cable.